There are 1,120 calories in a block of Velveeta, the cheese-like Frankenfood so often used to make queso. 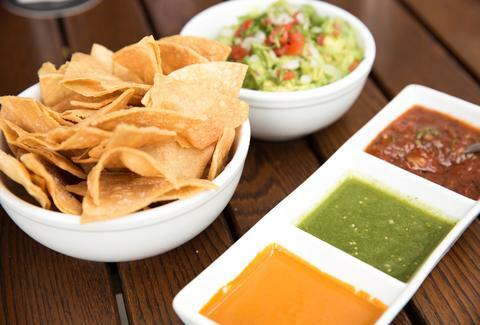 The good news is that where there's queso, there's also usually guacamole. Avocados are high in fat (one fruit will deliver 41% of your fat allotment for the day) but it's monounsaturated fat, otherwise known as "the good kind of fat" -- yes, there is such a thing. Dairy-based dips are heavy on fat, including the saturated kind, and calories; a ¼ cup serving of Ruffles French onion dip has 200 calories, 135 of which come from fat. 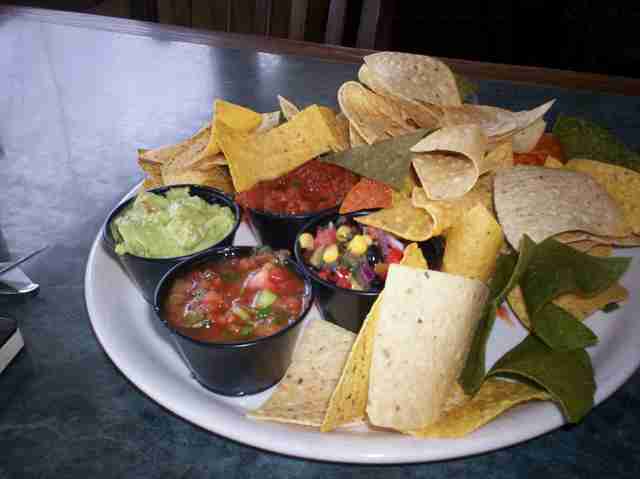 Compared to the same-sized serving of Tostitos restaurant-style salsa, which has 30 calories and zero fat, it's almost a no-brainer to opt for the salsa. If you want something that offers a mouthfeel more similar to a creamy dip, go for a bean dip; a ¼ cup serving of Pace black bean dip has 50 calories and no fat. If you can't quit the creamy dips entirely, leave the pre-fab varieties on the shelf and make your own, swapping low- or non-fat Greek yogurt for sour cream. A 6oz (12tbsp) container of fat-free Greek yogurt has 97 calories; the same amount of sour cream will set you back 360 calories. First we must discuss the matter of the terrible name. "Skinny Cow" is, indeed, a truly terrible name. But if you can get past it, you're in for a treat. Literally. Because Skinny Cow ice cream sandwiches are freaking delicious. 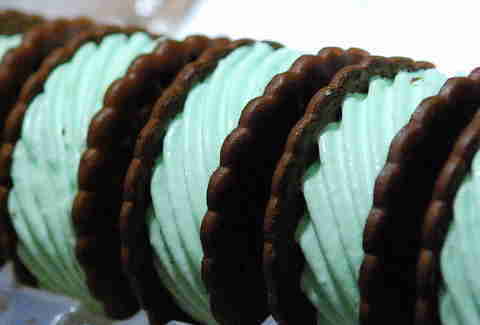 To make things even better, Skinny Cow's mint-flavored ice cream sandwiches are 150 calories, compared to 260 in a serving of Ben & Jerry's Mint Chocolate Cookie ice cream. Plus, Skinny Cow's single-serve packaging makes it easier to stick to an actual serving size -- this is crucial for people who frequently find themselves scraping the bottom of the ice cream carton in a single sitting. If you're a person who reaches for a box of granola in the cereal aisle in an attempt to be virtuous, knock that off. Granola, despite its reputation as a good-for you breakfast option, tends to be high in sugar and calories. Quaker Oats natural granola has 210 calories and 6g of fat compared to 120 calories and 1g of fat in a Thomas' English muffin. So feel free to splurge by spreading some jam in those nooks and crannies, and leave the granola for the hippies. 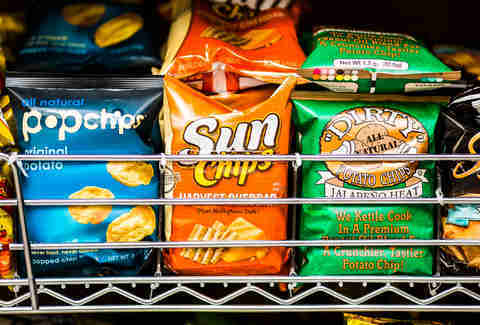 When a craving for salt & vinegar chips strikes, skip the Lay's and grab a bag of Popchips instead. You won't sacrifice much in taste -- they'll be salty, and vinegary, and plenty crispy -- but you'll save yourself 30 calories and 6g of fat if you opt for the Popchips, which also have about half the sodium of brands like Lay's. If nacho cheese or BBQ is more your style, Popchips have you covered. Ah, the Goldfish cracker, that delicious staple of the carseat set. They're not just for toddlers, and you would do well to remember that during your next tour of the snack aisle. A serving of cheddar Goldfish has 140 calories and 5g of fat. Compare that to Cheetos, which are calorically close at 150 per serving but which have double the fat, and getting in touch with your inner 5-year-old becomes a pretty easy choice to make. Jolie Kerr is a great lover of queso. Follow her on Twitter: @joliekerr.